The Climbing Park, Våler Kickoff Centre, Våler Aktivitetssenter, Moss, Norway - Climbing and swinging as Tarzan! In Våler`s dense "jungle" you can climb, swing and yell as Tarzan, not to say soar. With a 207 metres long Zip-line give you a wonderful feeling to fly through the air. On Sunday 28th September 2014 it was full activity here. Photo. From "vine" to "vine" as Tarzan. Våler Kickoff center offers adrenaline flowing with activities like paintball, sumo wrestling, ATV rentals, mega boxing, air rifle shooting, crate stacking, accommodation in huts and more. It`s located in the wild forest at the farm "nordre Paulshus gård" in Sperrebotn, Våler, near Hobøelva. Våler Kickoff-senter - "Våler Activity Centre" - is situated in a scenic location on Nordre Paulshus farm in Våler – just south for Moss and 60 kilometres from Norway`s capital Oslo. Fly high in the region`s best activity centre. Just like Tarzan you can climb and swing in the there right in the wild "jungle" in Sperrebotn in Våler. Be inspired and watch more photos on Moss Norway Travel Guide on Facebook. 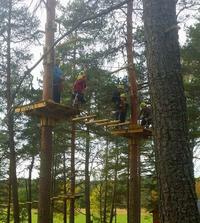 Våler Kickoffsenter`s climbing park consists of two tracks green and blue and a long zip line at 207 meters. In addition, mauve and red run in October, then there will be additional challenges for those who are used to heights. Tarzan swings through the jungle on a vine and yell. This is a fun experience for children and adults. At all ages puzzled på.Ta with some food and drink (or. Charcoal and lighter fluid) and enjoy yourselves at our barbecues afterward. In Norwegian: "Våler Kickoffsenter`s klatrepark består av 2 løyper grønn og blå + en lang zip-line på 207 meter. I tillegg kommer blålilla og rød løype i oktober, da blir det ekstra utfordringer for de som er vant med høyder. Dette er en morsom opplevelse for barn og voksne. Her har alle aldre noe å bryne seg på.Ta med litt mat og drikke (evt. kull og tennvæske) og kos dere på våre grillplasser etterpå". For more information, see Våler Kickoff Centre`s website. Open for drop-in every Sunday at 11-17 and Saturdays. Otherwise open for groups by appointment / advance booking all day. Minimum height of person to climb the park is 125 cm. Bring food and drink and use our grills/chairs/tables, or rent our beautiful function rooms. Bring a tent and stay outdoors for free if you like. We have lake Vansjø and the river Hobøl right here, with an abundance of wildlife in the water and on land. Visits must be by arrangement/booked.